The best way to decorate for Halloween is to make candy decorations galore! Whether you choose to display your decorations in a Halloween tree or hang them from the ceiling, preparing these yummy-looking treats is lots of fun! 1. Gather your materials. 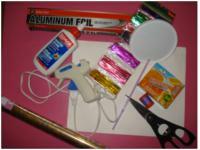 You will need white cardboard (we used an old duo-tang), Jell-O powder (any color, we chose orange), white glue, a drinking straw, colourful twist ties, hot glue, transparent wrapping paper, a hole-punch, a pencil, a round plastic lid, thread, and aluminum foil. 2. 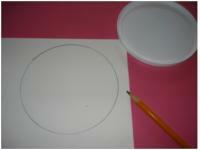 Trace the round plastic lid on the white cardboard and cut out the circle. 3. Place your white circle on the aluminum paper (to protect the surface). Apply white glue liberally to one side of the circle. Sprinkle Jell-O powder over the glue. Let dry. 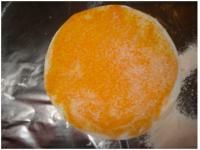 Note that the Jell-O powder darkens when it comes in contact with the glue and dries. Repeat on the other side. 4. Glue the drinking straw to the circle. 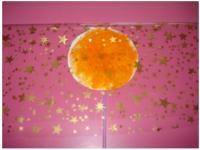 Using hot glue (which dries almost immediately) for this step makes it possible to complete the craft right away. 5. 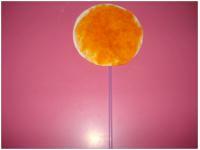 Cut a square piece of transparent wrapping paper and tuck your lollipop inside. 6. 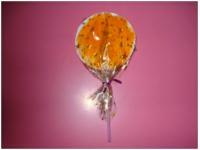 Using the twist ties, wrap the lollipop, cutting any excess wrapping paper with scissors. 7. 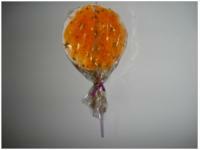 Using a hole-punch, make a hole at the top of the lollipop and add thread. Make several and hang to decorate!